There’s a whole renaissance (haha) happening at Plymouth Meeting Mall lately. They’ve built a bunch of new buildings with a bunch of chain restaurants. They’re also building out the largest Whole Foods in Pennsylvania. I guess the good thing is having some additional lunch options. While at PF Chang’s, we noticed the Redstone American Grill next door. Noone had ever heard of it before. With a need to escape the office, we decided to try it out. The place is pretty big, dimly lit, and seems to cater to the button down shirt and khaki work crowd. It’s not hip or young. You could see older middle management in suits hanging out here and getting steaks. Oh, and the place is so not cheap. 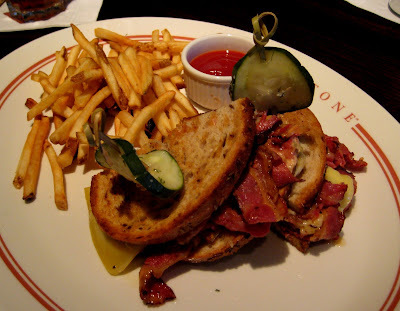 R went with one of their overpriced sandwiches – pastrami. She said it was good, but a bit too greeasy. And it wasn’t overstuffed with meat either. Redstone, where is this $14 coming from? 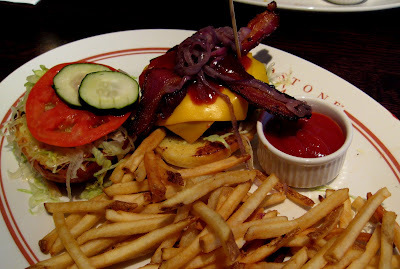 Both D and I went with the redstone burger, which came with cheese, apple wood smoked bacon, and barbecue sauce. I also got the optional grilled onions, which were red onions. A nice touch. This burger was huge, and there wasn’t enough bbq sauce on it, so when I asked for a side of bbq sauce, she brought me out a gravy boat full. It was glorious. It also came with fries, and I did like these fries quite a bit. Thinly sliced, crispy, delicious. The burger was pretty good too. A little difficult to eat since it was was practically six inches high. Service was fine, but it did take a hella long time for our food to come out. The food was ok, but like I said, rather pricey. It’s a lot, especially for lunch, especially only for a sandwich or a burger. Will I be back? Eh, not necessarily. Once may have been enough for me. I’m not convinced it’s worth it. I’ve been to this Redstone Grill 3 times and each time have been exceptionally pleased with the food as well as the service. They may be slightly pricy but not overly so in my opinion. Brunch is especially yummy. One word of warning-don’t order a Cosmopolitan unless you don’t mind paying 10.50 for a mixed drink.